A new version of GPU Caps Viewer, a graphics card / GPU information and monitoring utility, is available. For feedbacks and bug-reports, a thread is available HERE. This new version of GPU Caps Viewer brings the support of NVIDIA Turing-based graphics cards: GeForce RTX 2080 Ti and RTX 2080 and GeForce RTX 2070. But this new version is above all a bugfix release because I fixed a lot of bugs in GPU Caps Viewer itself, in the GeeXLab SDK, in the ZoomGPU monitoring SDK… Check the changelog for all details. + added NVIDIA GeForce RTX 2080, RTX 2080 Ti and RTX 2070 support. + added NVIDIA GeForce MX 150 support. + added Intel UHD Graphics 620 (ID:0x5917). + added driver properties (VK_KHR_driver_properties) in Vulkan info and report. + added GPU brand type (NVIDIA feature) in the report. + added an OpenGL 1.1 demo (simple RGB triangle, GeeXLab demo). + added min value of the GPU power limit for Radeon GPUs (GPU panel). + added info about GL_NV_shader_thread_group. + added /read_vk_amd_shader_core_properties and /read_vk_khr_driver_properties command line options to read properties of those Vulkan extensions (disabled by default on Radeons GPUs because of a crash in Adrenalin drivers...). * fixed bugs in the Vulkan plugin of the GeeXLab SDK (swapchain resizing and texture layout transitions). 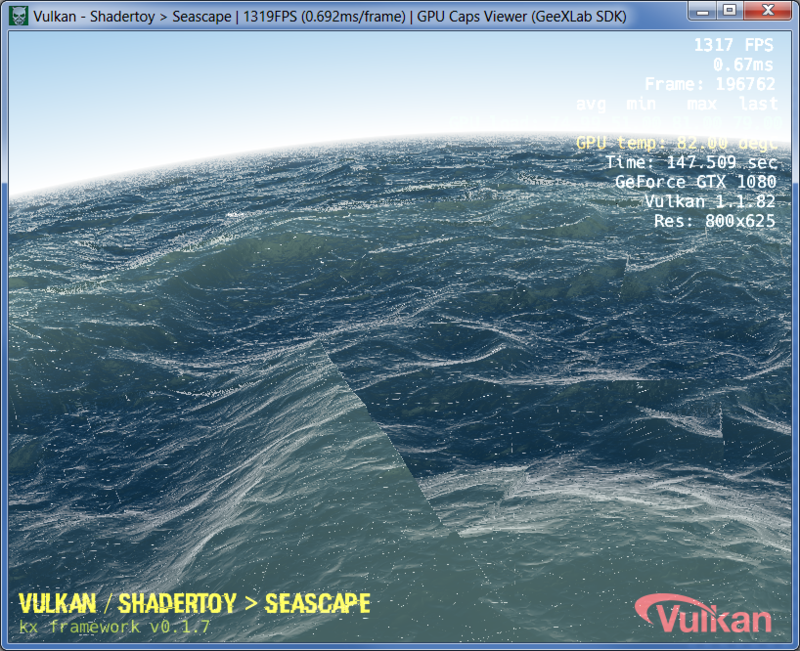 * fixed an uninitialized variable in the pixel shader of the Vulkan Seascape demo that caused visual artifacts on some GPUs (Intel...). * fixed bug in the geometry instancing demo (GeeXLab demo). * fixed errors in the syntax of the XML report (Vulkan section). * fixed number of TMUs for Radeon RX Vega 56.
! updated device ID / Subvendor ID fields in the GPU panel.
! updated BIOS reading for AMD Radeon GPUs.
! recompiled with latest Vulkan API headers (v1.1.90).
! updated: ZoomGPU 1.22.0 (GPU monitoring library). 4 – What is GPU Caps Viewer? Thanks for the feedback. Currently GPU Caps Viewer displays the TDP of the reference card (215W for a RTX 2080). But I will try to add real power like GPU-Z in the next update. Can you update links for 1.40.1.0 on “QUICK LINKS” and in “Download Zone” please? Still 1.40.0.0 in there. Thank you! The Seascape demo is now intersecting incorrectly and displaying lines and visual glitches. Vulkan 1.1.95, can you please update all your software to support 1.1.95? Thanks.